If I move the wires for 4IN- and 4IN+ to 3IN- and 3IN+ LED3 works properly, switching LED3 on >13.5V but off under that, but LED4 is still always on. So I don't think its the wiring, it just seems like comparator 4 doesn't work? I've also put a new LM339N in, but it makes no difference. Any obvious errors or thoughts? Edit/additional info Vin should hopefully never be below 12.5V, otherwise my battery pack is toast! I'm happy with how it currently works, with the current thresholds and LED brightness, except that of comparator 4. 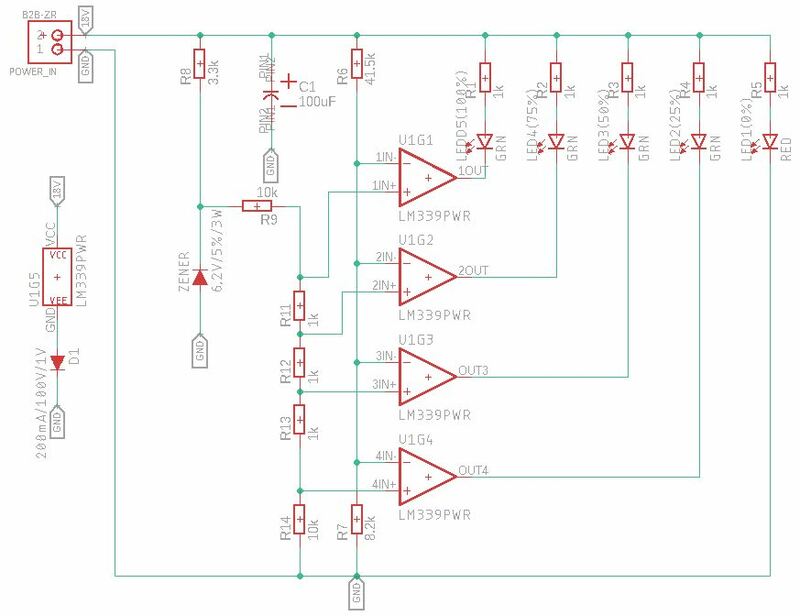 The power for this circuit is through a switched input, so it's not always on and current draw isn't really a concern, but I will look into improving it anyway. This will be used on a device outdoors, so I need the LEDs to be pretty bright. 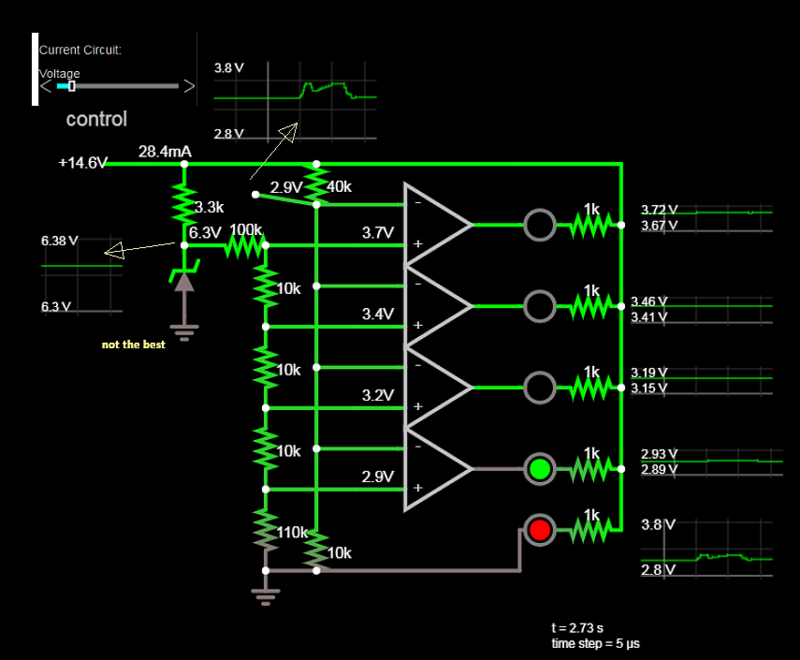 Would you like to specify your desired threshold voltages and tolerances? This design is poor due to Zener Rs but could be improved with R9,11~14 raised to 10x...to draw less current. Thus the R divider draws current from the Zener making its variation too much for your thresholds. The best R values depends on your SPECS. You can use whatever you want but you can see the threshold variation in the graphs due to the zener have improved. which caused your fault. I would put the battery on Red alert below 14V. Your reference won't work until the input voltage exceeds about 7V. You can replace the zener with a LM431 2.5V reference and adjust the resistor values, (or a TLV431 1.24V reference-- better because it needs less current to regulate, but more expensive). Well let this be a lesson to me and everyone reading this, don't overlook the simple things! Turns out my breadboard was faulty, so the rail that the comp4 output pin was on was shorted to ground. Thanks for all the help anyway, some of the answers have been helpful improving my design anyway! Not the answer you're looking for? Browse other questions tagged led batteries comparator or ask your own question. How to turn-on laptop's battery pack after replacing cells? Dim and “unblink” a pc power LED? 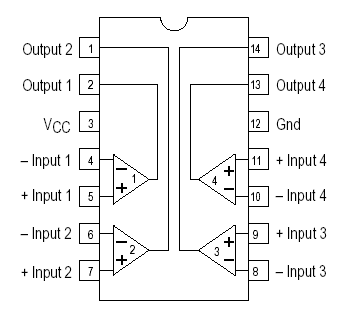 OP amp Comparator not working any tips?